The Reaction: Where "art" thou? Good art is often provocative, but provocation does not always good art make. Take, for example. 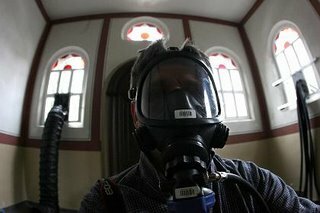 this report from Der Spiegel's English site about an art installation in the German town of Pulheim-Stommeln, which consists of a synagogue that has been hooked up to the tailpipes of six idling cars to make it into a gas chamber. Visitors can enter the empty synagogue / performance art piece by hiring a respirator from the Spanish artist behind this creative triumph, Santiago Sierra. Predictably, the installation has created a furor in Germany, and, to his credit, Sierra has agreed to meet with Jewish and community leaders to discuss their concerns with his work, but my qualms are more with Sierra's lack of creativity than with the tastelessness of his work. He claims that the installation represents the "industrialized and institutionalized death from which the European peoples of the world have lived and continue to live," but does simply creating a working facsimile of the machinery of industrial death and parading people through it succeed in actually representing anything? In my mind, representation must be at one remove from the thing the artist is seeking to represent for it to be art. That is, the art must be evocative of that which the artist seeks to represent, rather than simply just being that thing. Paintings and songs are not happy or sad in and of themselves, but rather they represent those emotions by evoking them in us when we experience them. As far as I'm concerned, Sierra has not succeeded in providing a single insight about the machinery of death with this work; he's merely reproduced it, which makes him about as creative as a forger or a photocopier. And whatever that is, it sure isn't art. Modern art has progressed to the point where nobody can be certain whether an artist is a hack or not, least of all the artist themselves. At least that is the witty and insightful comment I would leave if I knew anything about art. As a layman the true meaning of art has been buried by obscurity, elitism and fear of being labled 'mainstream'. In my crude and uneducated opinion, art is as much about articulation as it is about interperatation. The question of what a piece of art is about should really be as difficult as a question about the true meaning of christmas. The internal contradictions of Fairtrade? Madeleine Albright and "The Irony of Iran"